This summer, twenty little Blue Nile Tilapia were hand delivered to my door. I had given up all hopes of finding a supplier in Canada, and was thrilled when I found one near my home. The fish spent their summer growing out in the greenhouse where our first aquaponic system was made. Once the cooler temperatures of September came around, we relocated them to our basement, in a 100-gallon stock tank (giant water bowls for cows and horses). Here’s the growbed two weeks after seeding. October 15: The bok choy, kale and basil are already forming secondary leaves. Green onions, celery and romaine lettuce were store bought, cut and stuck right into the growbed. It’s amazing how they will continue to grow and regenerate. You can see water is continually being pumped (coming out of white tube) to fill the growbed. To the left is the bell siphon which automatically drains the water back into the tank once it reaches a certain level (1-inch below the surface). This flood and drain set-up is different than what we had previously done in the greenhouse. A timer is not needed and because the pump is always on, it’s less wear and tear on the pump. Kind of hard to explain without losing everyone, so I’m putting it out there to you readers, that if there is enough interest, we may put together some kind of a workshop where you can see how it’s done, or even build one to take home with you. Lemme know and we’ll see what happens. October 21: A week later, look how much they’ve grown. You can see towards the back where the black hose of the pump attaches to the white PVC pipe. The boxy black thingy is the digital thermometer to keep the tilapia’s water a toasty 80 degrees. October 26: So this is when I started noticing that the leaves were not as green as they should be; instead they were a mottled yellow. Everything I looked up indicated that it was low in iron. After more investigation, I realized that the timer which turned the lights on and off, wasn’t turning OFF. Who knew that plants needed a dark rest period? After turning the lights off for 6 hours a day, these pale green leaves started to darken up. October 29: New leaves are looking a little greener. Rainbow chard, assorted herbs, pea shoots and nasturtium is doing great, so are the tomatoes in the back. See how much the green onions have grown? November 12: We keep raising the lights to accomodate the fast growing vegetables. November 17: Look how much the tomato plant in the back has grown in five days. November 25: A lush jungle. Be sure to test the water often, especially in a new system. I rushed it a bit by putting the fish in before properly giving the tank time to cycle and build up beneficial bacteria. The green sample on the left shows ammonia at quite a dangerous level. After doing a 30% water change, and adding good bacteria from the shrimp tank, the levels were at an acceptable level (yellow mean zero ammonia) within a week. Good bacteria converts ammonia to dangerous nitrites, which then converts into nitrates…harmless to fish, wonderful food for plants. So what happened to our last remaining prawn? She was fine up until two days after this photo was taken. She died, after a molt, and had been dead a little too long for us to even want to eat her. I probably couldn’t anyways, we became friends in the end. Tilapia has been the easiest to raise as they are pretty hardy and can tolerate high stocking densities and fluctuations in water quality. Look at those eyes staring at me. We cannot be friends. I have to remind myself that or there will be no fish on the table. The fish had grown from tiny little 1-inch fingerlings to between 5-7-inch adults. They will continue to grow till they reach plate size of about 1-2 pounds (cross my fingers). This is definitely a male, that thing sticking out is his uro-gential pore where urine and milt passes through. This is a female, hard to see in the photo, but she has three openings, one of which is a slit (oviduct) to pass the eggs. We placed one male and five females in our second tank in hopes that babies will come. The male has claimed this flower pot and will try to entice one of the girls to come and lay her eggs. For some reason, the male looks nothing like the other females. He’s suppose to be a blue tilapia, but looks white to me. The girls huddle in the corner, not at all interested in following him home. The rest of the fish in the main tank. Did you know once they reach adult stage, the fish are mainly herbivores? That’s what I read anyways. Here, I’ve got cut up blemished leafy greens from the growbed, which leads me to wonder if they will eat sprouts? Rather than feeding my fish commercial pellets, I’m trying to grow my own source of fish food. Soaking in water, is some wheatgrass, red clover, and alfalfa seeds. Here’s how to grow your own sprouts from a previous post. Strain by pouring water out through the lid after soaking. Rinse and strain twice a day, and four days later, you have jars of sprouts. Pretty amazing eh? These alfalfa sprouts are rich in protein, carbohydrate and minerals. Good for everyone in the family. The chickens and rabbits also love it, the pig brothers, not so much. So did they like it? Yes, but the problem is the sprouts clogged up the pump which led to fish gasping for air as the water was no longer moving through the system and getting cleaned. I’m going to try it again, this time with some sort of a rigid screen box to sit the pump in and keep the sprouts out. I’m confident that it’s a good source of food for the fish; what I feed them will ultimately ends up in our bodies. Screens were placed on top of the tank after we lost one suicide jumper. Towards the right of the above photo, you can see clean water automatically draining back into the tank. So after we started the second fish tank, we also added a smaller second growbed to go with it. Right: Fluorescents (from the microgreen set up last winter) is hung from the rafters. The height is adjusted using S-hooks and a chain. The plastic pipe attached to the bottom of the growbed is where the water drains. It’s cut to the level that you want your water to reach just before it drains. The hardware cloth around acts as a barrier to keep the clay pebbles and any debris from clogging up the drain. Hubby holds a 2″ diameter pipe, with several cuts made at the bottom to allow water to flow in. A cap is placed on the other end, this “hood” fits overtop the drain pipe. In other words…what you are looking at is the makings of a bell siphon. Water through vacuum pressure, is sucked up into the bell, and when water fills the growbed, will automatically drain. Confusing I know. But it works. Washed clay pebbles are added to the new growbed, which is from the bottom of an extra rabbit cage I had lying around. Bell siphon in action; you can see the water reach just below the growbed medium before it drained. You never want the water level to reach the surface or it will encourage algae growth and get all black and slimy. It will also compete with your veggies for oxygen and nutrients. November 25: Spinach, rainbow chard and bok choy was planted by sprinkling the seeds directly onto the clay pebbles where they fall into the crevices. November 27: Two days later and the bok choy have sprouted! November 29: The bok choy have doubled in size, and the rainbow chard has sprouted. December 3: Bok choy has secondary leaves, and the spinach is finally starting to sprout. 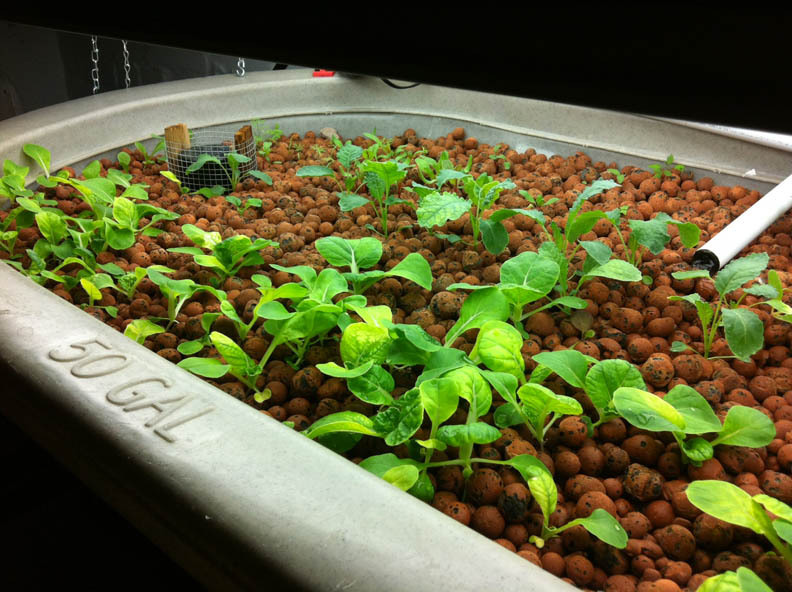 Our little aqua-urban farm in the 6′ x 8′ room in the basement… growing food year round regardless of season. January Update: Basement aquaponics a month later. Summer Update: We’ve switched it up! Ducks instead of fish…visit this link for Backyard Duckponics. March Update: Basement aquaponics a year and a half later. I live in Ottawa, Ontario and I am trying to find a Canadian source of Talapia stock to purchase (preferably not the genetically modified “males”). Any help, advise, or info would be so much appreciated. I have an Aquaponics Greenhouse and I’m looking for different ways to feed my Tilapia. I’m currently growing duckweed, but would like to grow several things. Have you tried the sprouts again? Do you have any other ideas? I will appreciate any help you can give. Jill Chen - Hi Dana, I’ve heard of people trying red lava rock – also known as Scoria (from landscaping supply places). Is there a hydroponic supplier near you? They may be able to suggest an alternative. I wouldn’t use smashed up clay pots. What you want is something light, has lost of surface area for bacteria to grow (that’s why expanded clay, or shale, or recycled glass stone is good as they are light with all the air pockets inside). Some people have used river rock and gravel, but very heavy so you need to make sure your growbed/table will support all the weight. not placed in open area,I mean BASEMENT. Thanks for providing great photos and comments/how to’s. I have a concern about setting up my tank in the basement. How do you manage the humidity in the basement? Is there an issue with mold? Michael Paoli - Hi! I teach math and science in a public school in New York. 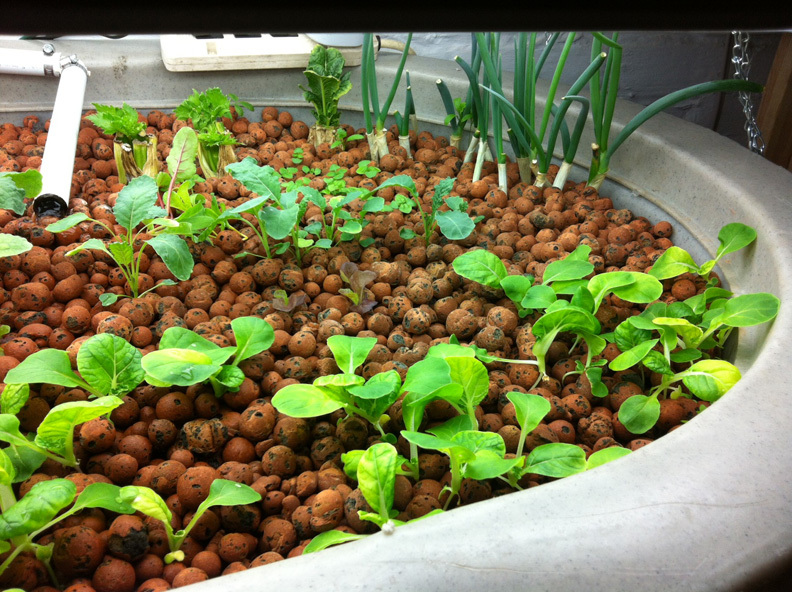 Next year we plan to set up a small aquaponics system in class. I think a 90+ gallon tank might work. We plan or raising edible fish and vegetation as a science inquiry, then we will have a BBQ at the end of the year with parents! We will also be hooking up Arduino units to monitor and feed the fish using some basic robotic programming. We will use sensors to test the water chemistry in our fish tanks and create an automatic fish food catapult that we can control from any computer anywhere in the world. We will be asking tough questions about where our food comes from and if can we create sustainable food production in the city. All this will be done through the lens of mathematics and science. Your advice would be helpful. We’re also looking to find some grant money. this - pictures look very professional. yusuf mario germino - wow. great blog. i just got to check it out now. Im having a problem keeping the water clean. I have a swirl filter and a biofilter, but i get rapid sediment. 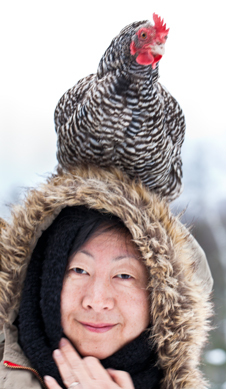 ives - Hi are you based in Toronto? I would love to learn how to grow Tilapia ! Are you looking for some volunteers? I hope your somewhere near Toronto lol Let me know if you are! Your aqua system looks very impressive! I too would like to try start one myself. where do you buy the live tailapia fish ? Chris Diaz - Greetings, I love eating Tilapia cooked in any manner, and exploring in starting my own at home. How do I go about starting my own? Thank you for sharing your experience and expertise. Max - Very cool Site! Catherine Todd - Had to post this twice, since I LOVE your blog! What a wonderful site a friend of mine referred me to… and it’s just what we want to do here in Guatemala, in finding ways that some of the poorest people who suffer from great malnutrition might be able to survive. Many of them do not have electricity so we will have to find ways to run a pump without it… hopefully solar will do the trick… but we can implement your basement growing practices outdoors. I’m going to be a subscriber right now! Thanks for such encouraging interesting and funny words describing your projects and for the clear, excellent photos that accompany the text. With both of those I think we can do it! how did you 1st get your tilapia. I’m in Montreal and i’m having a very hard time to find. shauna - Where did you get the talapia from and did you need a special license? Mike - Truly great operation. I am a novice and am interested in creating an aquaponic system in basement. I was wondering where you obtained your fingerlings. At this point I am interested in tilapia, however I have not had any success in locating any. I would greatly appreciate any assistance you may provide in this area. Shaffie Mohammed - How can I get started on a Do It Yourself system for my basement. There are so many kits out there but they are too expensive. walter toy - real cool story! thank you! tom - I would like to start out small and expand to local commercial farmers market sales. I would need to build a heated space for this operation. This would give me an opportunity to learn about some of the problems I would have to overcome. I too live inEdmonton, and am in the middle of setting up tilapia tanks and an aquaponics room in my basement. What food are you using for your tilapia, and can you recommend a source? If you are interested in going in together on any supplies purchases, I am interested..
Erich - Hi thanks so much about posting on Aquaponics. That looks very nice. I am wanting to start my own Greenhouse and am learning about this way of gardening. Since i live in Manitoba i will have to deal with weather but I would love to get in contact with you about the whole setup and supplies. Scott Hargreaves - Where did you get your Blue Tilapia. It’s still hard to find. Trung Nguyen - I am testing my aquaponics system in my garage with goldfish. The goldfish is doing fine and the plants are growing but I would like to have Tilapia. Where do we get small tilapia in Montreal? Michel Badiere - Very interesting website! Do you still have Aquaponics workshops? I am interested in starting a small scale aquaponic system in my basement to raise tilapia. Would please send me all information, date, and price of the workshop. Thanks for a prompt answer. I was wondering do you sell prawn would you be able to ship to alberta ?